It’s the last winter of Mei’s high-school career, and much to her enjoyment she has plans with Yamato and her friends as graduation slowly approaches. Meanwhile, Ren has realized that he might have feelings for Mei, and struggles mightily to figure out what to do while jealously looking at Mei’s pictures on Yamato’s blog. Rin isn’t doing a whole lot better and is still reeling from her breakup with Kai, putting both twins in unfortunate situations with their love lives. Click below for a better reading experience and more manga reviews! Say I Love You has spent a lot of time in its last few volumes following many of the side characters such as Ren, Kai, Megumi, and others, and while a number of these stories worked fairly well, I still found myself hoping that Mei and Yamato would again become more of the main focus again as their high-school career winds down. This ended up being the case in this volume, but the first chapter starts off by concluding Ren’s little arc following him developing feelings for Mei. I definitely wasn’t the biggest fan of Ren’s story coming into this volume because of how painfully awkward and generally unnecessary the storyline was especially in the previous volume, but I actually thought that Hazuki-sensei did a pretty good job considered wrapping this all up in a satisfactory fashion. Ren’s feelings are displayed very clearly as he indecisively longs for Mei despite his own internal protestations, and I thought that it was interesting to see him go through a full-range of emotions when his jealousy erupts awkwardly in a confession. I think that the reasons why he likes Mei could have been explored a little bit better, but I liked that Hazuki-sensei really dug deep in a number of little sequences showing Ren trying to make sense of his feelings. It felt appropriately painful and hard to watch, and by the end of his segment I had been sold on this showcase of an awkward guy trying to process these completely new feelings without making a mess of himself. While Ren’s internal side to this segment was done fairly well, what made this storyline really pay off was the way that it was used to reinforce Mei and Yamato’s relationship in a new way. After a chapter primarily following Ren, the perspective shifts after his confession to Mei as she tries to deal with it. This is an excellent sequence because of the way that she takes a step back to reflect on herself, and really think about the feelings of both Ren and Yamato before acting. This ends up reinforcing Mei’s relationship with Yamato in a really tangible way that really showcased how much her feelings have developed over the course of the series as the two talked out what had happened, and I was really please how natural this all felt. This was encapsulated nicely by a string of text-messages she sends to Ren in response, and I really liked that this really showed Mei having a sense of self-awareness for the way that she has grown from the person she used to be. The second half of this volume follows Mei, Yamato, and their friends during their last couple months of high-school, and I really liked the way that this provided a capstone to the series thus far. There are a number of really good sequences here which perfectly capture the mix of nostalgia and nervousness of these teenagers on the cusp of moving onto the next stage of their lives. The first is based around Mei’s trying to find a replacement cell phone, and this sequence uses this transition as an opportunity for her to reflect upon the memories linked to this cell-phone. A piece of recurring imagery contrasting Mei at the beginning of the series to herself now is first used in this sequence, and I really liked that this captured realistically the way that one might reminisce when picking up something from the past in real life. A second excellent sequence shows Mei and her girlfriends having a sleepover and discussing their fears for the future especially towards their respective boyfriends as things begin to change. I thought that this scene showed a great deal of nuance in capturing this trepidation towards the future, and I thought that this brought a great deal of emotional resonance into the story as they wrap up their time in high-school. The final stretch of this volume returns to Mei and Yamato just before their graduation, and this segment is really well-done. The two walk throughout the school to reflect on their time there, and again we see Mei comparing herself now to how she was at the very beginning of the series. The contrast here is extremely palpable both in terms of the way that she treats other people with regard to their feelings, and I really liked the way that the art showcased her own process of growing up into a young woman. I was continually drawn to the way that the changes in Mei’s hair really signified this process as I read through the series, but this was really emphasized in this chapter when we see the stark difference between Mei now versus her at the beginning of the series. It’s one thing to repeat over and over again how much a character has changed, but I really enjoyed the way that the art has accompanied this as she grew up over the course of this series so far. We also get a really nice montage of her memories at the school to reinforce this change, and I thought that this really emphasized her feeling of standing at the cusp of ending one stage of her life and moving on well. The final twist as this volume ends is also super sweet, and I have to imagine that it must have been tempting for Hazuki-sensei to end the series right here, because this volume really captures that sort of closure that one might expect at the end of the series as Mei leaves high-school. Much like life, Mei’s will roll onward in the next volume, but I though this volume did a great job closing out Mei’s high-school days as well as the series as we’ve known it so far. Say I Love You Vol. 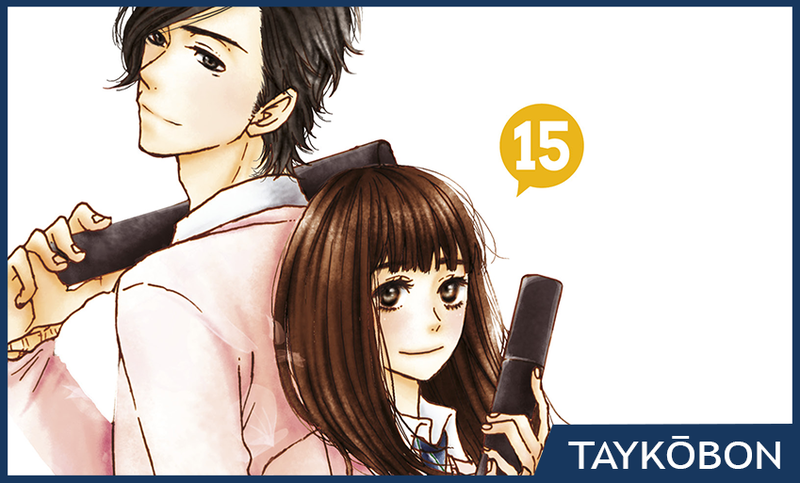 15 is a nostalgic ride that really feels like it could have been the end of the series because of the strength with which it wraps up Mei’s time in high-school. The end of Ren’s story-arc in this volume was quick and painful to watch for his sake, but I was impressed with the nuance that his feelings were captured with as well as the way that Mei’s response emphasized the development in her feelings for Yamato. The montage at the end of this volume as Mei walked throughout the school really captured her feeling of standing on the cusp of adulthood, and I’m definitely curious to see how things change heading into the next stage of these characters’ lives. Say I Love You Vol. 15 was published by Kodansha Comics USA on August 2nd, 2016. Authored by Kanae Hanzuki, the series began in 2009 in Kodansha’s Dessert magazine. An anime adaption by Zexcs aired in Fall 2012 and ran for 13 episodes. Volume 15 will be published in English on August 2nd, 2016.